Soil texture describes the size ranges of soil particles. It is estimated in the field by experienced soil scientists and can also be measured in the laboratory. Texture is assessed in the field as the "feel" of the soil as a ball (bolus) of moist soil is manipulated between thumb and forefinger. How moist soil feels when manipulated in the hand is influenced by how much sand, silt or clay is in the sample, as well as by other soil components such as organic matter or calcium carbonate. Organic matter is an important contributor to soil texture and helps to ameliorate stickiness and also helps sandy soils hang together, making them feel more loamy. Soil texture has a major influence on agriculture as it influences aeration, water movement and storage, nutrient holding capacity and erodibility. These new maps of Soil Texture for Victoria provide a broad statewide overview of surface soil and upper subsoil texture groups and were developed as part of the DEDJTR Systems for Enhanced Farm Services (SEFS) program in June 2014. 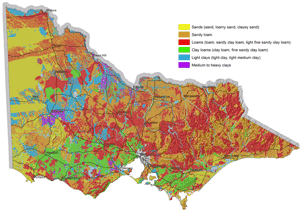 They have been created from soil data observations within the Victorian Soil Information System (VSIS) and provide a statewide overview of soil texture across Victoria. They are based on best-available current data and will be further developed as new data becomes available. The data used to produce these maps has been derived from previous soil and land surveys conducted over the past 50 years and the intensity of source data used varies considerably across the state. The maps cannot indicate soil texture at the local scale, but can be used as a generalised indication of likely texture at a regional scale.. Considerable variation in soil texture is likely within a region, depending on factors such as soil type, landform and landscape process. 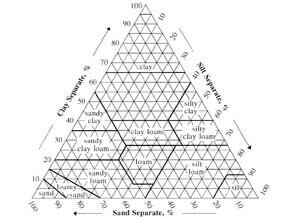 Sand, silt and clay percentages are related together in a triangular graph. The graph shows groupings of soils and the name that is given to that grouping. So, silty soils always have more than 25 % of silt sized particles (organic material makes soils feel silky and therefore more silty). Loams all have less than 40 % clay sized particles. When moist soil is manipulated in the hand, sands, loams and clays feel very different (refer Quick Reference Guide - Assessing Soil Texture). The relative size of particles is important. For example, the finest sand particles are 10 times the diameter of the largest clay particles. The surface area of a spherical particle 0.02 mm diameter is 100 times greater than a spherical particle of 0.002 mm diameter. Clays have an even greater surface area than spherical particles are they are made up of sheet-like structures stacked together. This difference in surface area contributes to the differences in adhesion and cohesion of the texture groups. Further information on soil texture is available in the Soil Health section of the VRO website.